The diagram on the left shows a small subset of the viral genomes that are present in a virus stock. Genomes are indicated by lines, and mutations are shown by different symbols. The consensus sequence for this population is shown as a line at the bottom. There are no mutations in the consensus sequence, even though every viral genome contains mutations. 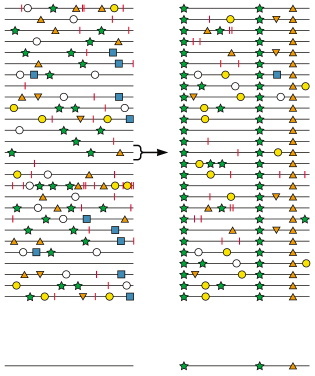 One of these genomes, indicated by the arrow, is able to survive a selection event (also called a genetic bottleneck), such as passage to a new host. This virus multiplies in the host and a new population of viruses emerges, shown by the diagram on the right. The consensus sequence for this population indicates that three mutations selected to survive the bottleneck are found in every member of the population. Error-prone replication ensures that the members of the new population have many other mutations in their genomes. The type of population selection illustrated above most likely took place during the emergence of the new influenza H1N1 virus that is currently circulating globally. Imagine that the upper left diagram represents the sequences of one viral RNA segment of an influenza virus that is infecting a pig. The animal sneezes and several million viral particles are inhaled by a human who happens to be nearby. Of all the virions inhaled by the worker, only the one near the arrow can replicate efficiently in human cells. The three mutations are then present in that RNA segment of all the viruses that multiply in the human’s respiratory tract. Imagine similar selection events leading to a new population of viruses that are well adapted for transmission from person to person. The quasispecies theory predicts that viruses are not just a collection of random mutants, but an interactive group of variants. Diversity of the population is critical for propagation of the viral infection. Recently it became experimentally feasible to test the idea that viral populations, not individual mutants, are the target of selection. We’ll examine those data next. Is there someplace to read about this experiment? I'll even try to muddle my way through a peer-reviewed research paper. Being a software guy, I'm finding the algorithmics of these natural processes fascinating. I am still trying to wrap my brain around the implications of quasispecies theory and the high rate of RNA mutations. Would this mean that a human infected with the novel H1N1 would be expelling new virus particles with a range of RNA sequences? So when we see the genetic sequences for a particular isolet in the CDC files, the same individual is probably producing other particles with other genetic sequences at the same time? Or am I missing something elemental here? right on the head with your question. Your answer I think also took care of my next question… When infected people are tested or swabbed for virus particles, a mixture of particles are being sequenced simultaneously, by whatever magic blackbox/sequencing machine/process you use, the amino acid sequences from the sample are decided by a 85% (?) level of agreement on an single position. And if a position has above 15% (?) difference at a single position, that this would generally constitute a single mutation point on that strand of the RNA by definition. Could a single nasal swab test then ever provide a situation where a single position had a 50%-50% variability, thus providing two different isolate sequences? Or is this just not mathematically going to happen due to low rate of mutation against the length of RNA? but why then don't we see some differences, sometimes ? is there still reason to believe the viruses are different ? polymerase used to amplify the RNA for sequencing. This is a tricky subject that actually needs more depth to properly explain than is provided here. This explanation and the diagrams mislead the reader into assuming the polymerase “knows” to fix those base pair positions that allowed the virus to escape whatever the bottleneck was. This is a dangerous mindset to get into because it doesn't accurately reflect what is happening. It is just as likely for viral RNA's after the bottleneck event to have mutations at those particular postitions that cause it to revert to a pre-bottleneck sequence. The polymerase is always making random mutations, the environment is the deciding factor on how those mutations effect the fitness of that viral quasispecies. Wow this stuff is intense! how exonuclease recognizes the mismatched base pair ?